Micro-needling is a cosmetic process that has been in use for at least a decade. The procedure involves using a device equipped with very fine needles to create pinpricks on the skin surface to allow better penetration of skin products. In addition, creating microscopic breaks on the skin triggers the body to go into repair mode, enhancing elastin and collagen production. What is the DermaPen Treatment? The DermaPen is a micro-needling device shaped like a pen with very tiny needles attached to the tip. This device, manufactured by Utah-based DermaPen LLC, is an updated version of the derma-roller. The DermaPen and similar micro-needling devices were designed following the same principles as laser and chemical peels: destruction of a skin layer triggers new and healthy growth of skin cells. How does the Treatment Work and What is the DermaPen Used For? During the procedure, your practitioner will position the DermaPen vertically against your skin then turn the device on. A small motor moves the tiny needles back and forth, rotating them slightly. This will create micro wounds on the treatment site in just a few seconds with very little effort. Your practitioner can change penetration depth of the needles if this is required. Typically, cosmetic products such as hyaluronic acid or moisturizing serum will be applied after the skin is prepared with the DermaPen, ensuring maximum absorption of the products and better results. The DermaPen treatment is used for skin resurfacing in the case of acne and other scars. The micro-needles break up the fibrous scar tissue to trigger regeneration with healthier cells. It is minimally invasive and appears to be a safer option than laser therapy. Since the process encourages collagen production, the DermaPen may be used in areas where skin regeneration will improve surface skin layer. 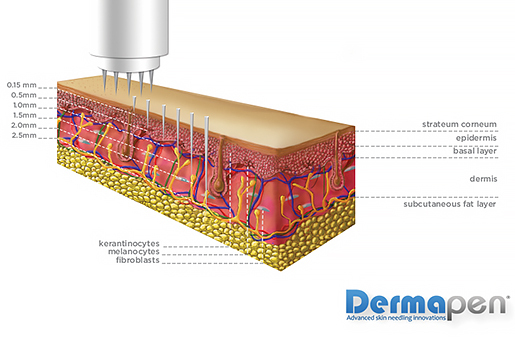 the DermaPen is designed to allow manipulation in hard-to-reach areas. Micro-needling with the DermaPen should be a fairly painless process unless you are hypersensitive to pain triggers. Side effects include minor swelling and some redness of the treated skin that will be resolved within 24 to 48 hours. You will not need to schedule time off from work for a DermaPen procedure because you can proceed with your regular schedule right away. The number of DermaPen sessions you will need will depend on several factors, including the severity of your condition, needle depth and your reaction to the initial treatment. Your practitioner will explain your options and the costs involved. Our team will discuss discount programs and the VIP package that could lower your costs.